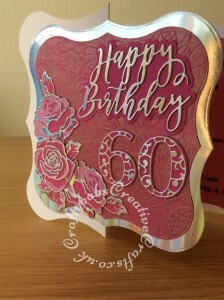 Quite a few of our friends are turninig 60 this year so I’ve been busy making cards. Here are two larger cards, made 3 months apart but sharing a similar colour scheme. I also used my new favourite type of sentiment dies. 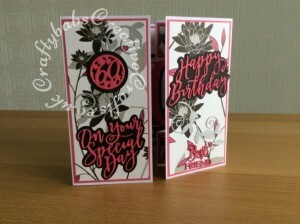 In the case of these two, they are Cardmaking Magic Dies by Christina Griffiths (from Craftstash.co.uk). I love multi-cutting these to create a more dimensional finish. The first card is more sparkly and ‘blingy’ (I used Cosmic Shimmer Glitter Kiss over the embossed background) which suited the recepient to a tee. 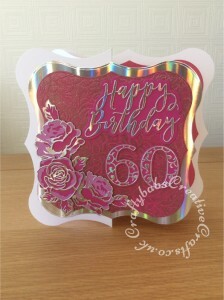 I used a shaped 8″ card blank and then echoed the shape with the matting and layering using similar shaped nesting dies. For Full sized pictures and details of dies and materials used, just click on the images. The second card is a bit of a monster in terms of size, I used three 8″ square card blanks to create a double shutter card. The sentiments on the front are done in the same way as the first card but then heat embossed with clear embossing powder, I used some additonal ones too. 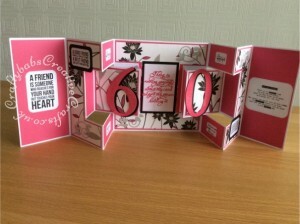 The sentiments inside were stamped onto white card and the die cut. 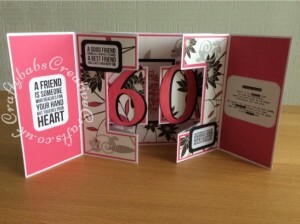 The centre inside sentiment is die cut using an old Tattered Lace die. The large numbers were also heat embossed. For more views of both cards take a look in the Gallery at the Ladies Extra Special section. This entry was posted in Cards, General.